After almost 7 years of living in our “forever” house, we finally have a working fireplace. The fire bricks were too old and damaged to be safely used, so we decided to install a woodstove instead of rebuilding the whole firebox. By the time we got serious about dealing with it, we also had to get some repointing and re-flashing done on the chimney itself. 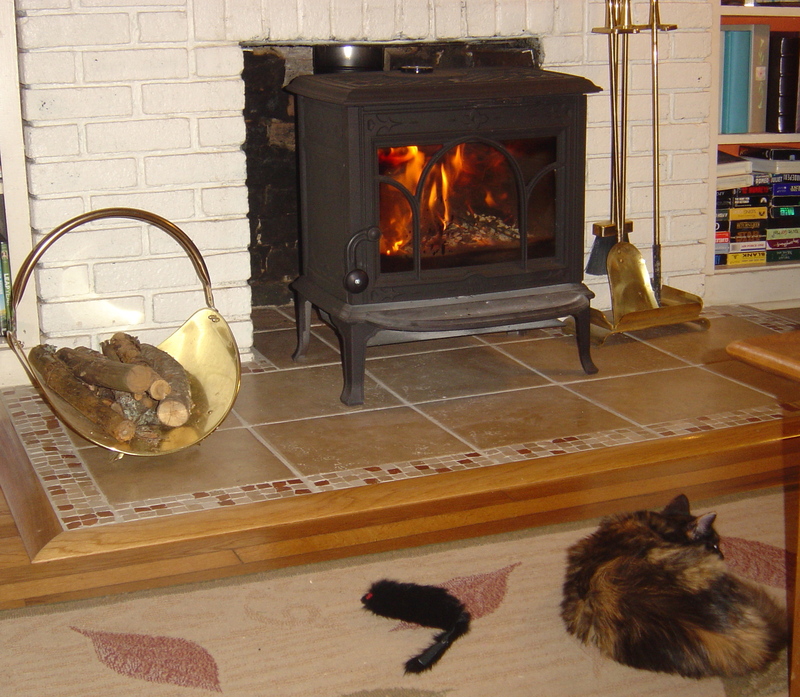 After having the masonry work done in the spring, we laid a new hearth after returning from Ireland and had the woodstove installed in October. 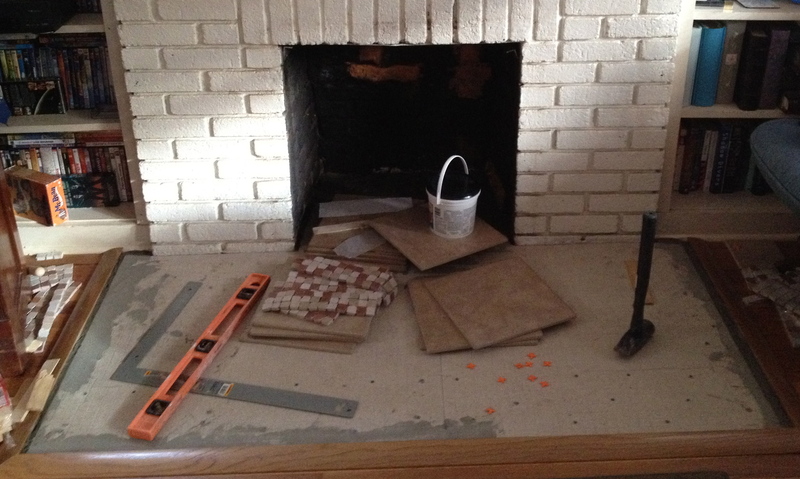 To save money I built the hearth, but we decided to leave the chimney liner and stove installation to the pros. 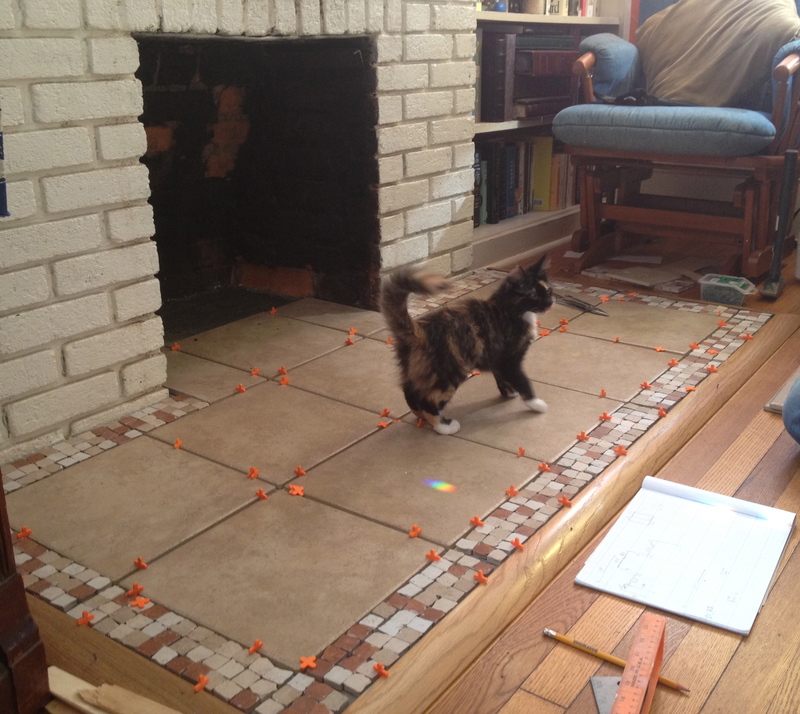 Ms. Elsie was my curious assistant through the tedious tile-laying process. She has enjoyed the fruits of her labors ever since. 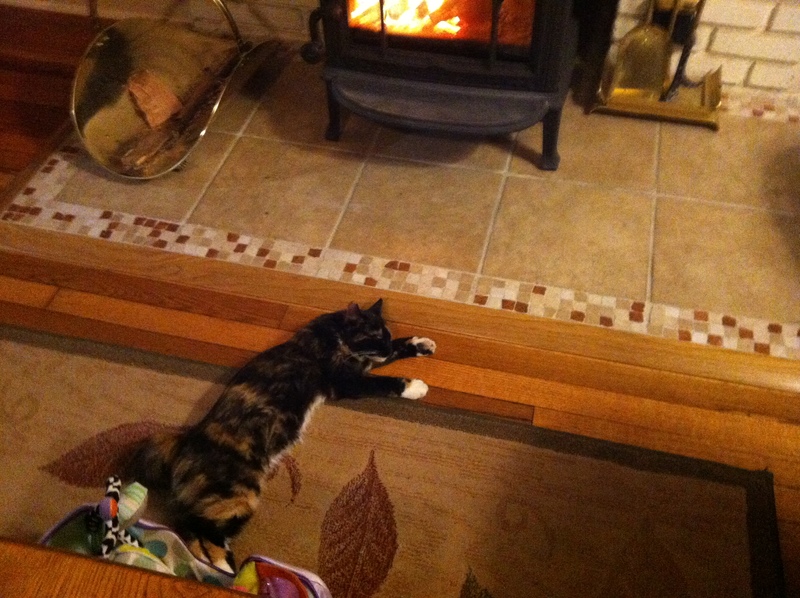 Elsie certainly understands the old Irish saying níl aon tinteán mar do thinteán féin (there’s no fireside like your own fireside). Making the Perfect Hot Whiskey. Tips from an Irish Bartender. How do you make the perfect hot whiskey? Well, my first job was in an Irish bar, and I’ve tried a great many variations since then, so let me share the secrets. I’d put the slice of lemon in the drink, but whatever floats your boat. I love a good hot whiskey (and who doesn’t?). One of its many virtues is you have to be a fairly big eejit to mess it up. Even the laziest barman throwing a spoonful of sugar into a glass with a stingy measure of whiskey, a bit of dry lemon that’s been sitting in a dish all day and some recently hot water can be assured the resulting drink will be reasonably pleasant. However, with a little effort the hot whiskey can be a work of delicious art. Some notes on terminology: a hot whiskey is often called a hot toddy, but the toddy is a name for the drink used mainly in Scotland, and as I understand it, is a fairly purist whisky, sugar, lemon & water concoction. In Ireland, we spell it whiskey — and if you can’t taste the difference between whiskey and whisky, you’re wasting your money. (A few other countries claim to make whiskey/whisky; how nice for them.) 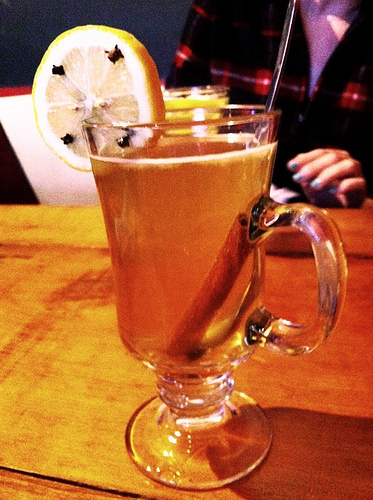 A hot toddy is also often used as a generic name for a hot alcoholic drink (thus a mulled wine or a hot apple cider are sometimes referred to as a hot toddy). So I call just call this a hot whiskey to prevent confusion. A hot whiskey used to be known as whiskey punch. The early temperance movements vilified it (hence the phrase “punch drunk”) and the name fell out of use. The drink, however, never really went away. First ingredient, and possibly the least important, is the whiskey (never whisky — don’t waste good Scotch by watering it down. Enjoy it neat.). Generally, use the cheapest whiskey you can find. Living in the US, I usually use cheap Canadian rubbish that I’d never drink neat. If you make a hot whiskey with expensive, smooth sipping whiskey, not only are you wasting your money, but the resulting drink usually has much less of a whiskey taste. The smoothness of aged Scotch or Bushmills is intended for a neat nip or a pair of ice cubes, and needs nothing more. When in Ireland I use Powers or Paddy, and save the Jameson for drinking over ice. Fill the glass with boiling or near-boiling water to warm it. Empty it out after a minute. This helps the hot whiskey stay warmer longer. Wet the top eighth of an inch of the tankard and dip it in white sugar to encrust the rim. Now, pour a measure or two (Ah! go on now…) of whiskey into the glass. Add a spoonful of sugar (brown adds a distinctive and slightly different taste compared to white, but the choice is yours). A thick spoonful of honey is great if you’re legitimately fighting a cold/sore throat and not just pretending to. Wash an organic lemon well in warm water to get the wax coating off (don’t be messing with a regular lemon — do you want to drink the chemicals they spray on them?) and cut it in half. Cut a thick slice from what was the middle. Now, cut that slice in half and remove any pips. If you’ve already added a single measure of whiskey, just squeeze the other half of your slice into the glass. If a double, squeeze some of the remaining end of the lemon into it as well. The whole half a lemon would be a bit much, but it’s all dependent on your own taste. Take four cloves and stud the half-slice of lemon with them. Push them in fully so they won’t float out. Fill the glass almost to the brim with boiling water. Stir to dissolve the sugar. (For years I left the metal spoon in the glass, in the belief that it would absorb the heat and prevent the glass shattering, but an engineer friend recently explained that this has no effect on the fate of a too-thin glass.) Now drop the clove-studded lemon in — taking care not to splash and lose any;-) — and away you go. Add a cinnamon stick to give a slightly different flavor to the drink. Don’t add ground cinnamon, the taste of that tends to be gone before you’re halfway through your drink and it doesn’t dissolve, it adheres to bits of the lemon instead, so you end up with this nasty looking brown sludge swirling through your drink! One or two of these on a cold night will take all your cares away, and lubricate good conversation. Colm Tóibín‘s new novel, Brooklyn, is a deceptively simple story of one young woman packed off to Brooklyn in the 1950s. Eilis Lacey is a younger daughter with no firm prospects for either work or marriage living in a small town in Ireland during the early 1950s. So, her spinster sister and widowed mother arrange a new life in Brooklyn for her through a visiting Irish priest. When she arrives in this strange land, Eilis finds a job, a room at a boarding house, and church duties all waiting for her, but she feels bereft of the generations-old social network that surrounded her at home. Much to her surprise, she gradually makes a place for herself in Brooklyn, and even strikes up a relationship with a well-intentioned Italian man. However, despite the material success, she can’t fully commit to her new life in Brooklyn because her heart is still in Ireland. When tragedy brings her back home, she discovers her time away has made her appear exotic and interesting to the men of her town, and her American experience makes her more attractive to employers. Of course, along with the good there’s also a newfound appreciation for the bad, as she has a new understanding of small-town spitefulness. Finally she has to decide between assuming the role others would choose for her, and the life she could choose for herself. The most striking thing about Tóibín’s Brooklyn, besides the beautiful prose and atmospheric evocation of both communities, is the terribly unfashionable lack of irony. Despite the hardships and unfamiliarity, the possibilities represented by emigration are painted in a positive light. Eilis may dwell on the differences and mourn her easy friendships and almost unconscious understanding of the least aspects of social life in Ireland, but despite herself she is thrilled by the differences: the amenities of a big city, the mix of nationalities, and the opportunity for interesting work. Eilis lives in a boarding house with a group of women representing the range of accommodations immigrants make to a new culture: form stubborn denial through total capitulation. Despite the opportunity to attach herself to the established ex-patriot community, Eilis seeks out new experiences and company. Tóibín cleverly underlines that even these seemingly daring choices are easy when in a completely new community. It’s only when Eilis goes home, ostensibly just for a month’s holiday, that she discovers how even small changes can be judged harshly by the community. She must choose whether or not to embrace her new life fully, or else deny her experiences in Brooklyn like a summer fling, and take her place in the unchanging routine of the small town. The decision is a hard one, and one that most novels about emigration either never broach or telegraph on the first page through an ironic tone and constant degree of condescension towards the old world. It’s a tribute to Colm Tóibín that his even-handed treatment of both communities allows the reader to feel the full weight of Eilis’ decision. 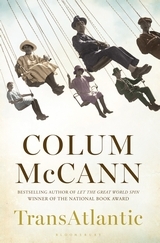 Colm Tóibín’s Brooklyn has been adapted as a film starring Saoirse Ronan as Eilis Lacey, with Jim Broadbent, Julie Waters, and the in-demand Domhnall Gleeson.